Master Sgt. 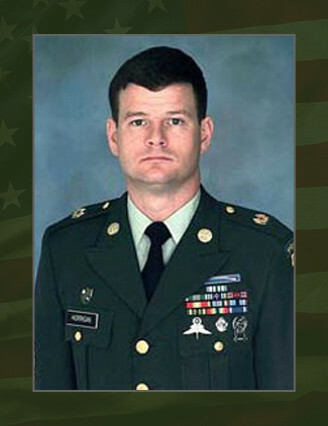 Robert M. Horrigan died June 17, 2005 in western Iraq while conducting combat operations against known enemies of the United States of America. He was born Jan. 13, 1965 in Limestone, Maine. Horrigan enlisted in the Army as an infantryman in May 1984. He served with various units to include the 75th Ranger Regiment, Fort Benning, Ga. After a brief separation from active duty, he reenlisted and was assigned to the 5th Ranger Training Battalion serving as a team leader and Ranger instructor. In February 1991, he volunteered for Special Forces and graduated from the Special Forces Qualification Course in September 1991. Horrigan was then assigned to the 1st Battalion, 7th Special Forces Group (Airborne), where he served as a senior Special Forces weapons sergeant. He completed several significant military courses while in the U. S. Army to include the Basic Airborne Course, the Ranger Course, the Jungle Warfare Training Course, the Instructor Training Course, the Special Forces Assessment and Selection Course, the Special Forces Qualification Course, the Spanish Language Course, the Jumpmaster Course, the Special Operations Target Interdiction Course, the Scuba Course, the Special Forces Dive Supervisor Course, the Military Freefall Course, the Military Freefall Jumpmaster Course and the Advanced Noncommissioned Officer Course. Upon his graduation from Ranger School in 1985, Horrigan was awarded the Merrill’s Marauder Award. He competed in the 1987 Best Ranger Competition at Fort Benning, Ga., where he placed second. His awards and decorations include the Bronze Star Medal (2), the Defense Meritorious Service Medal, the Meritorious Service Medal, the Joint Service Commendation Medal (2), the Army Commendation Medal, the Army Achievement Medal (3), the Army Good Conduct Medal (6), the National Defense Service Medal with bronze service star, the Armed Forces Expeditionary Medal, the Afghanistan Campaign Medal, the Iraq Campaign Medal, the Global War on Terrorism Expeditionary Medal, the Global War on Terrorism Service Medal, the Humanitarian Service Medal, the Noncommissioned Officer Professional Development Ribbon with numeral three, the Overseas Service Ribbon (2), the Presidential Unit Citation, the Army Superior Unit Award, the NATO Medal, the Combat Infantryman Badge, the Expert Infantryman Badge, the Master Parachutist Badge, the Military Freefall Jumpmaster Badge, the Scuba Diver Badge, the Ranger Tab, and the Special Forces Tab. He was posthumously awarded the Legion of Merit Medal, the Bronze Star Medal for valor and the Purple Heart. Horrigan is survived by his wife Denise, his daughter Courtney, his mother Mary, his sister Lisa Shine, his twin brother John and brother Daniel.